The original Tom Sawyer Island opened to the public at Disneyland Resort in 1956, and has the distinction of being the only attraction actually designed by Walt Disney himself. Walt found himself unhappy with the island’s original design, so days before construction was scheduled to begin, he took the plans home and re-imagined the landscape design, creating the inlets, coves and overall shape that the island is known for today. Today, there are versions of this classic attraction at Walt Disney World, Disneyland Resort and Tokyo Disneyland. Take this fun quiz to test your knowledge of Walt Disney World’s Tom Sawyer Island. What land is Walt Disney World’s Tom Sawyer Island located in? How does one get to Tom Sawyer Island at Walt Disney World? Tom Sawyer Island is a recreation of a famous book by one of America’s most famous authors, Samuel Langhorn Clemens, better known as _____________? 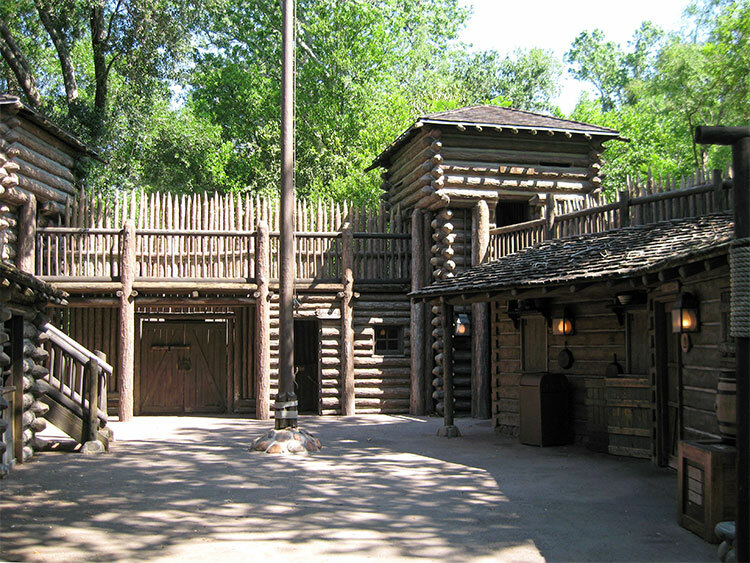 What is the name of the fort on Walt Disney World’s Tom Sawyer Island which includes a blacksmith shop, audio animatronics, a watch tower, fake cannon, fake rifles, stables, and an escape tunnel? Years ago WDW cast members would hide 6 items each morning around Walt Disney World’s Tom Sawyer Island before the park opened. If you were one of the lucky guests to find one of these items, then you would receive a FastPass for your family that was good for any attraction! What were the items that were hidden each day? Which is NOT a name of one of the Walt Disney World’s Tom Sawyer Island rafts? The mill on Walt Disney World’s Tom Sawyer Island that has a giant waterwheel on the outside, is named_______? What is the name of the forgotten cavern on Walt Disney World’s Tom Sawyer Island that has tight, rocky passageways where strange fossils and jetting stalagmites mingle? What is the name of the riverboat that sails around Walt Disney World’s Tom Sawyer Island? Walt Disney World’s Tom Sawyer Island used to have a quick service restaurant named ___________. 100%!!! I got 100%!!! I was born modest…Fortunately, it wore off. Fun quiz! I guess I did pretty good having only been to Tom Sawyer Island only once!! I’m surprised how well I did! The only Tom Sawyer Island I’ve visited is the Disneyland version, and that was many many years ago to the point that I don’t remember most of it! You need to go to the one at WDW!!! I always find myself without enough time. Magic Kingdom has a lot to offer. And this attraction closes early and requires a boat ride there, which eats up time. Think of it like Rafiki’s Planet Watch, only with much more stuff to do in the rest of the park. Yeah…. been sometime since I read the book, and also quite some time since I’ve been in the island…. I still miss Aunt Polly’s. Unpretentious but a great out of the way place to relax with a snack. We still have a cup that a sundae came in from years gone by. I never ate there, but it looks so cute!!!!! Not bad considering I’ve only been there once! Its time to visit again!! !